Online shopping has taken off in a big way this Christmas. Supermarkets are struggling to meet orders following a sharp and much bigger than expected rise in demand, while traditional High Street retailers are coming under increasing pressure from online rivals. Internet sales have risen 50% compared with last year's pre-Christmas period, bringing joy to many an online store, while High Street sales have risen just 0.9%, according to IMRG, which represents e-tailers. "Britain's 24 million internet shoppers spent £2.253 billion online during November, an average of £94 each," IMRG says, and December will prove equally rewarding for online shops agrees Deloitte, the consultants. "The internet is gaining ground on the High Street," observes Deloitte. "More than half of UK consumers will buy online this Christmas." 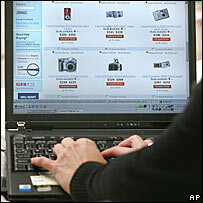 In November the value of internet sales in the UK rose above £2bn, a fresh monthly record, IMRG data suggest. And yet, almost one in five retailers say they "do not believe the internet is an important channel to market", Deloitte says. "The safety of shopping online continues to be a major concern to many consumers, especially the millions of novice internet shoppers," acknowledges IMRG's chief executive James Roper, adding that "some online shopping services are much better than others". Consumers should be aware of pitfalls, agrees Deloitte partner Richard Lloyd-Owen. 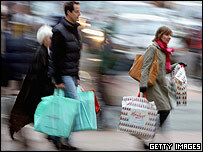 "This year some consumers may fall victim to companies either losing or failing to deliver the correct orders," he says. "When you buy online it's often not clear who you can speak to when something goes wrong and consumers like to complain face-to-face." The trusted online retailers keep pulling in the business though, and this benefits the traditional retailers that have realised how important the internet is to their commercial success. "High Street store websites are the most popular for Christmas shopping," according to Deloitte, adding that "Brits will spend more than £150m a day online in the run-up to Christmas." And anyone who thinks this is a young person phenomenon should think again. "The 45-55 age group are most likely to use the internet to buy most of their gifts," Deloitte observes. Trusted e-tailers obviously include the main regular supermarkets, which have reported a massive rise in orders. According to the Financial Times some supermarkets have been forced to stop taking online food orders while they are struggling to get to grips with demand. Some online supermarkets reportedly contacted customers as early as last month to warn them they would struggle ahead of Christmas. Indeed, there have already been some customer complaints over a lack of delivery capacity. Nevertheless, the virtual customers keep arriving in electronic droves. Even though Christmas is nigh, shoppers are still choosing the internet over traditional shopping, thus displaying a remarkable trust in postal and delivery systems. Supermarkets say they will keep delivering until 22 or 23 December, with market leader Tesco's 1,500 delivery vans now barely stopping to refuel, and Sainsbury's saying it has responded to the shock rise in demand by opening up a third more delivery channels, thus allowing online shoppers to keep clicking until 19 December.